“C’mon the ‘Reeeee”. Regular as clockwork. Hollered across a sun-drenched Oval. The sole note of positivity amongst a Surrey support getting increasingly bothered along with the hot that they might have expected given a forecast for a 23° afternoon. 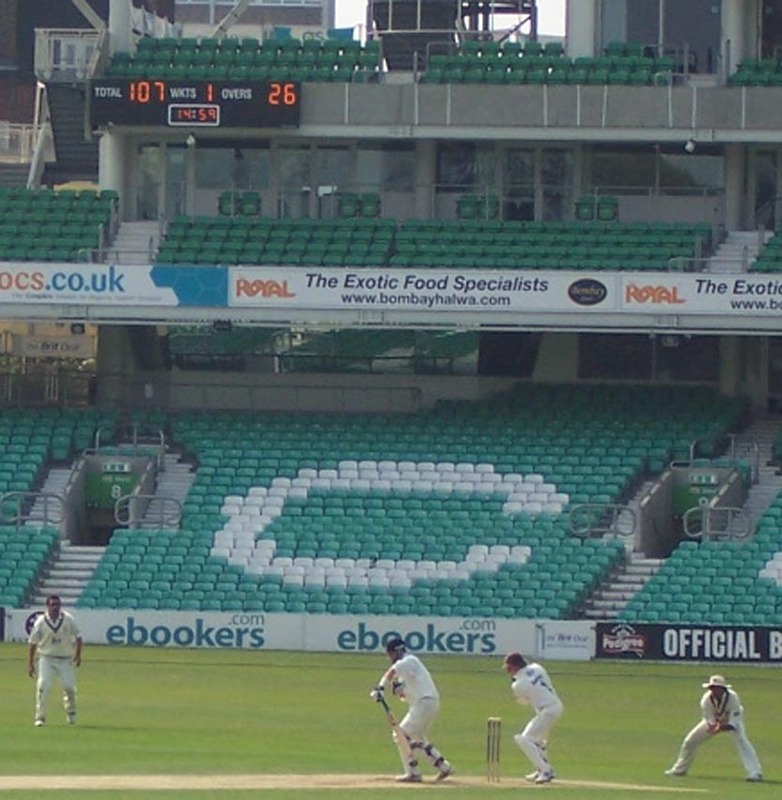 “C’mon Hampshire, you’re boring to watch” shouts another, large-ish, man shoehorned into a replica one-day shirt at the front of the Peter May Stand. Considering they are going at over four-an-over in a four-day match, this reveals merely a disquiet that the Surrey bowlers cannot cause anywhere near the same trouble that the Hampshire attack had in the morning session. Well, I say the Hants attack, but it was essentially the Warne/Tomlinson show. I decided to take the day off work today as a response to the piece in this year’s Wisden encouraging cricket supporters everywhere to make the most of Shane Warne’s remaining time in the game, time he will spend now solely with Hampshire. It is easier to get to the weekend one-dayers and Hampshire’s appearances in the environs of Greater London on Sundays have long been pencilled in to the hobo diary (although the long standing trip to Chelmsford two days after this action had to be aborted for reasons of a weary body and an even wearier wallet). Glad I made it to this though as the impact of Warne’s tactical nous and the pressure he puts on opposing batsmen is better witnessed in the longer form. It looked nicely set up after stumps on the second day, with Hampshire 360 ahead on first innings but with the increasingly prolific Mark Ramprakash and the reliable class of Mark Butcher occupying the creases and both well set. However, Butcher, moments after reaching 50, flicked a mistimed sweep from Warne into Nic Pothas’ waiting gloves, dropping like a tiddlywink into a tall egg-cup. After that, a succession of batsman came and went quickly (four leaving with a resigned quack), all trying to play Warne as though using their bat to fend off a rabid, aggressive weasel. Thus three of Warne’s five wickets in not very much time come courtesy of a plumb striking of the pads, along with a terrific low reflex catch at slip by Chris Benham. Aside from Ramprakash, who completed his 89th first-class ton (when not watching aghast from the non-striker’s end), only fellow leggie Ian Salisbury looked to have the measure of Warne, hitting a couple of fours before Tomlinson broke through his confidence as well as his guard and uprooted a couple of his stumps. This, if nothing else, showed the value of spin and seam working together, and while James Tomlinson might not be a Glenn McGrath, this performance showed that, like a blue movie actress of unspoken vintage, he knows his way around a good length. Two for fifty-three from his twenty overs does not adequately reflect the quality of his relatively long unbroken spell, nagging away like an over-protective mother spying rogue dirt behind progenous ears. Despite a 278-run advantage on first innings, Warne doesn’t enforce the follow-on, giving his top order carte blache to treat the bowling like it’s Sunday league stuff. Michael Brown doesn’t need asking twice and sets the tone with a series of crisp boundaries. James Adams however is not quite as assured and eventually spoons a simple catch to Butch at leg-slip off Salisbury’s otherwise expensive and ineffective leg-spin. 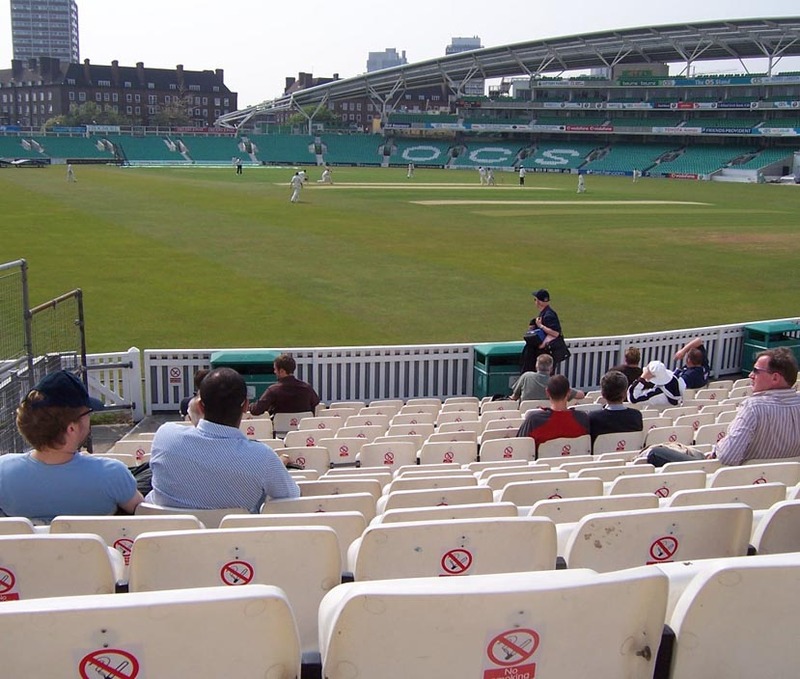 Some in the crowd suggested that, in the ten minute changeover between innings and with the matting of cloud cover gone, the pitch was getting easier to bat on. It’s a theory we’ll come back to in a moment. 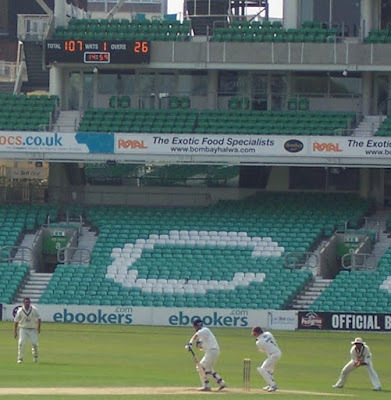 Elsewhere, during the afternoon session, and after tea, once Warne had declared with Brown on 115 (getting to this century from only 124 balls) and John Crawley, showing the tenacious, sagacious form of last season, on 66 (having celebrated getting to 50 by reverse-thwacking Nayan Doshi swiftly to the boundary), setting Surrey a four session target of 503 to win. For the Surrey crowd it all seemed pretty bleak, expect for one group, amongst whom is our friend metronomically encouraging with the reductivist “C’mon the ‘Reee.” I half contemplate responding with a “C’mon the ‘ire”, but that’s just asking for aggro whichever way you look at it. As Surrey knock up the first run of their second innings with a cheeky bye, our man’s concentration returns to the game; “closing in on target, in on the taaaaargeeeet” he sings, Guantanamera style. As the day draws to a close, Surrey put up decent resistance but Adams snaffles Scott Newman at slip off the bowling of James Bruce while, perhaps crucially, the “Southern dancer” (to quote our man at the back) is stumped off creaky old Shaggy (Shaun Udal) by Nic Pothas. So, as yesterday, they hit stumps with two men down and a hundred on the board, but this time with the star man gone. However, the idea that the pitch is getting easier stays pertinent, particularly with a scorching day forecast. 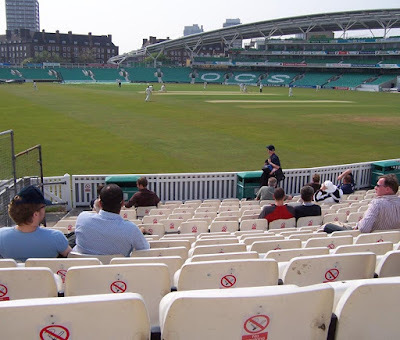 So it was to prove, as Surrey got within 36 runs of a victory that would have seen them equal the fourth-highest fourth innings run chase ever in first class cricket. Batty’s century at the top of the order set the tone, aided an abetted by Butch with 72. At 283-7 all may have seemed lost but Ian Salisbury and Azhar Mahmood put together a partnership of 157 for the eight wicket, and may have felt confident of victory and at least a draw. However, despite losing the day’s most effective bowler, Udal, to a suspected broken ankle, Hampshire eventually broke the pair and wrapped up the remainder within seven runs, and with only 5.3 overs left in the day.